The forecast was glum, and so were our moods. After breakfast I bade farewell to Yasu-san and his party and headed back, through thick cloud, over Kisokoma then across to its neighbouring peak of Naka-dake before dropping down into the high walled cirque of Senjojiki where the ropeway up into the Central Alps deposited visitors at a heady 2600 metres. I plonked myself down on a bench outside the doors of the souvenir shop at the top of the ropeway, satisfying myself by putting off my inevitable retreat, at least for a few minutes anyway. People had already ridden up on the ropeway and were wandering about taking in the cloud obscured views. A few hardy hikers, packs on back and poles in hand, ventured out into the cirque on their various missions and I wondered if they’d paid attention to the forecasts. The cloud lifted a little as I sat there and I noticed many more people, further out, heading up the steep path lining the southern rim of Senjojiki. 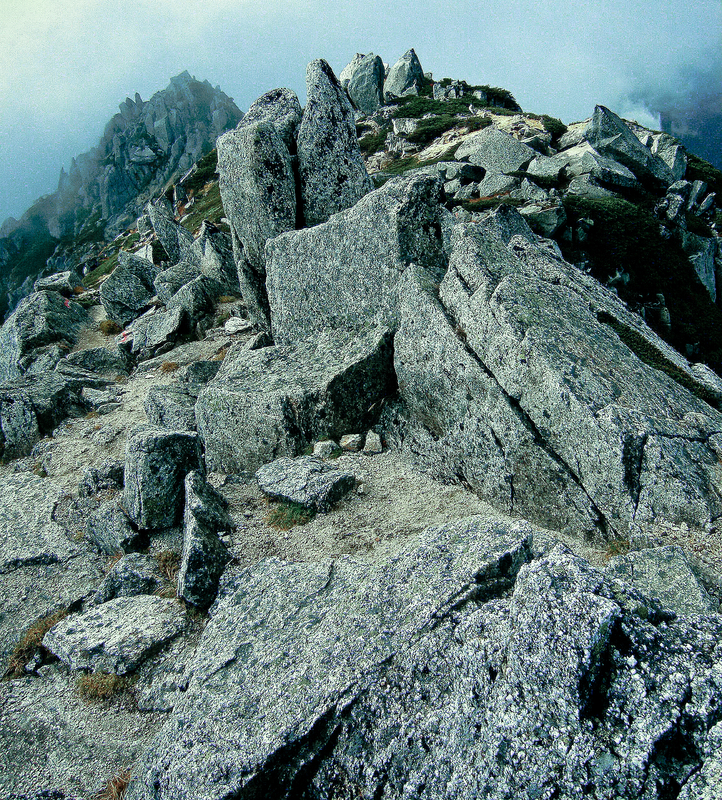 Most were probably looping around over the rocky pinnacle of Hoken-dake. I wondered if any of them were taking a punt and heading further south. A sliver of blue sky appeared over those high walls. It was the only sign I needed. I stocked up on water from the vending machines at the souvenir shop and got back to it. If worst came to worst there was an emergency hut on the ridge, about three hours hike away, halfway between Kisokoma and my next target: Utsugi-dake. Atop the southern walls of Senjojiki I stood at the trail junction. 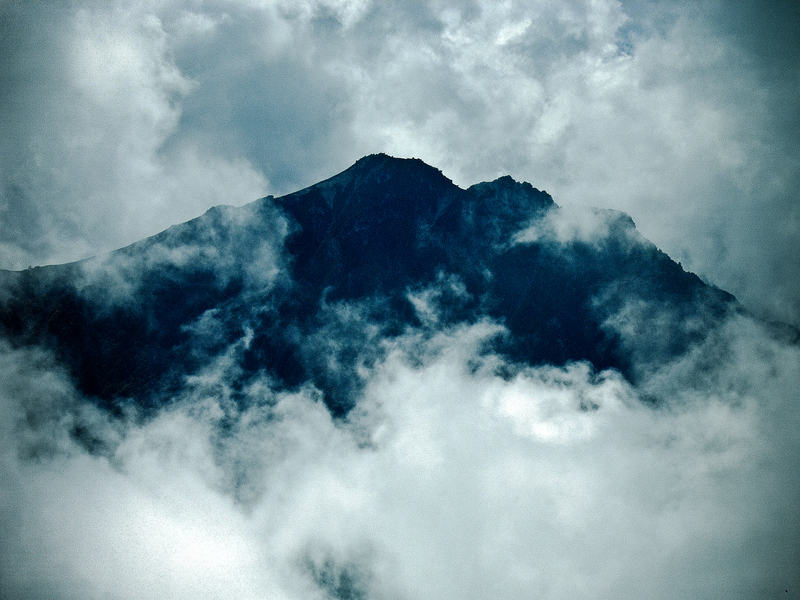 More fair weathered skies appeared through swirling cloud clung stubbornly to the spine of the slender alpine ridge. Everybody up there was turning toward Hoken-dake, and vanishing into a wall of white. To the south, where Utsugi lay, I could see a fair distance along the ridgeline. By the look, it was possible the conditions would hold. Travelling light, I moved fast. The path was wide and easy to follow, rising and falling over crests in the ridgeline. Crests topped with gnarly sections where creeping pine conspired with small boulder strewn outcrops to make progress difficult. It was in one of these knots of rock and pine that I caught my first group of hikers heading south. One of them, a man separate from the others, hiked with a walking stick, a bulging, green, canvas haversack hung on his back. As I waited for the group to move over a section of boulders he looked back and noticed me, ‘Gaijin-san,’ he said quietly to himself, in a seemingly surprised tone. The others moved past the man, younger and faster they quickly disappeared into the tangle of pine ahead of us. ‘Konnichiwa, Gaijin-san, do you speak Japanese?’ the man asked me with a booming voice. ‘Konnichiwa. A little,’ I replied. He spoke to me in English. ‘Where are you from?’ he asked like they all do. ‘Australia,’ I answered, like I always do. ‘No,’ I shook my head. ‘I live in Nagano City. Do you know it? Nagano City is the largest city in Nagano Prefecture. Nagano City. Nagano Prefecture,’ he made sure I caught the distinction. ‘It is famous for Zenkoji Temple. Matsumoto City is number two,’ he held up two fingers. ‘At Kiso-den Hut,’ I said. ‘William,’ I answered and he turned to me. I stared at him puzzled, the clouds had begun to lift higher off the mountains and a weak sun was shining. ‘Oh, yes, yes,’ I replied, my thoughts on the weather and the mountains and the hike suddenly assailed. ‘My name is Kazuhiko. It’s difficult for foreigner’s tongue. My simple short name is Kazu. It is simple. You can memory easily. You say: cat in zoo – Ka-zu. I am ninety-one years old,’ I looked at him and thought no, then glancing at his walking stick was tempted to reconsider. Some of the Japanese do age well, but…’Ninety-one!’ I said gasping and he realised his mistake and laughed. ‘Sixty-one,’ he corrected himself, ‘Six and nine is upside down. I am sorry, I can’t hear or balance,’ he went on to add and I looked at the drops either side of us, they weren’t gaping maws but for a tottering old bloke with a walking stick no drop needed to gape to fall into. ‘I like film camera. William-san, here, take my photograph,’ and he showed me how to operate his camera. ‘Don’t drop it. It’s expensive!’ I had him stand with his back to the way we’d come, a backdrop of boulders littered the creeping pine and the mountains, lined one behind another, sported crowns still adorned with spots of cloud, their eastern flanks glowing with the golden leaves of snow stunted trees. I handed the camera back and he told me to take his place and he fired a shot off at me and we pressed on. That sounded good to me. Seeing the expressions of everyone at the Kisokoma Hut at breakfast one could have been forgiven for thinking Noah’s flood was in for a return. 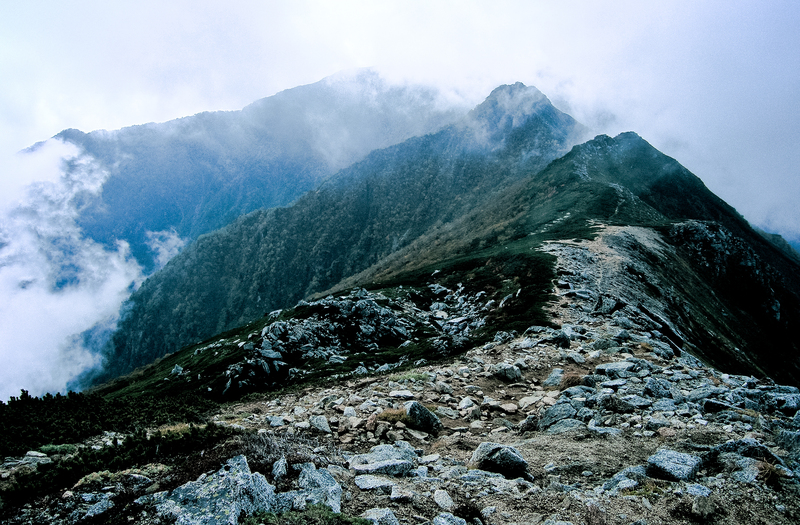 We walked on together, the silence of the mountains replaced by Kazu-san’s ongoing banter. I arrived at Kiso-den Hut as the afternoon sun was swallowed in cloud. Checked in, I asked when dinner was to be served as I thought I might attempt Utsugi-dake before then. The bearded, bespectacled master said I had about ninety minutes. The map said I’d need ninety up and sixty down. I restocked with water and, sucking air into my lungs, hit the towering 300 metre climb sitting right on the hut’s doorstep and was up it in forty-five minutes. Over dirt, over stone, over slabs of rock face impaled with bolts holding timber steps. The sun was a white disk strafed by grey cloud. 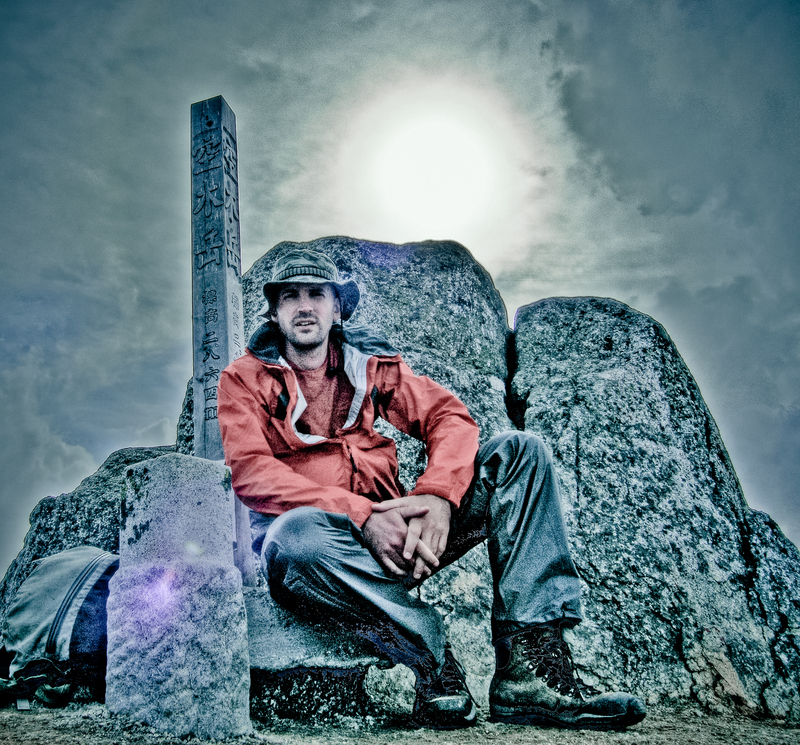 I collapsed amongst the pillars of granite on the summit, chugged water, fumbled with my camera for a mountain top proof shot, then got around to catching my breath. A wall of black cloud clamoured behind the peaks south of Utsugi. Like an army held in pattern yet baying for blood. I trembled, fearing a repeat of my Shiomi episode. At least I was on my way down. I trod carefully over the wooden footholds bolted to the summit rocks and then, full focus on my footfalls, attacked the downhill. Fifteen or so minutes above the hut, the clouds could resist no more and spilled in over the mountains. Ten minutes later fat drops began raising puffs of dust on the trail, but I was almost there. The hut master nearly fell off his chair upon my triumphant return. I bought a water but need not have bothered, as the heavens opened monumentally outside. Looking around, and quickly climbing the stairs to the second floor to double-check, I realised Kazu-san hadn’t arrived – unless he was in the crappers. In the best Japanese I could muster, I asked the master if an old bugger with a green pack had turned up. He was bearing gifts of lettuce and coffee. Negative, was the response. And we waited, watching the rain, thankfully not accompanied by thunder and lightning, tumble out of the sky. Chinamini (FYI): If you’re climbing the Hundred and fancy being immortalised on the Kiso-den Hut’s Wall of Hyakumeizan Fame, make sure Utsugi-dake is your 100th summit and, I assume, stay at the hut. I don’t know what proof you need, it was just a conversation I had in passing with some other gentlemen staying there that night. Call ’em at the hut and see. This entry was posted in Hyakumeizan, Mountains 91 - 100 and tagged chuo alps, hiking, hiking in japan, hyakumeizan, japan, mountains, nagano, utsugi-dake. Bookmark the permalink. Looks like you made the right decision pressing on to Utsugi instead of opting for the ropeway down. Sometimes you just can’t trust the forecast and have to gamble. Had I known about that 100 mountain ‘wall of fame’ I may have saved Utsugi until the end, as I did end up staying in that hut.